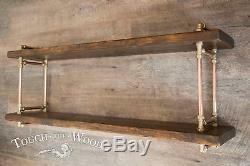 Copper Pipe & Brass STEAMPUNK Wall Shelf INDUSTRIAL Reclaimed Wood Display. Dimensions: length: 100 cm (39.5") height: 46 cm (18") depth: 22 cm (8.5") distance between columns: 75 cm (39.5") distance between shelves: 33 cm (13") shelf thickness: 3.5 cm (1.5") weight: 15 kg The planks are reclaimed pine , previously used as scaffolding boards. The wood is protected with dark oak stain, but the colour can be customized to your needs. 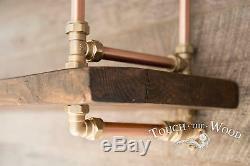 The pipes are COPPER (15mm thick), originally used in plumbing industry. They are polished and covered with high gloss metal lacquer, however we can leave it unprotected if you want the metal to darken during the time. The pipes' joining are BRASS. 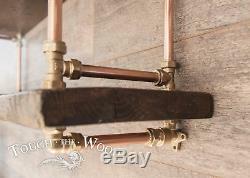 The vertical pipes go through the shelves which makes the construction extremely STURDY AND DURABLE. The size and amount of shelf can be customized, just let us know your needs. As the shelf is made to order, it may take up to 2 weeks to complete. 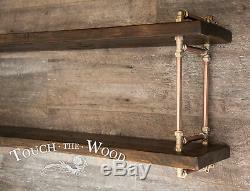 The item "Copper Pipe & Brass STEAMPUNK Wall Shelf INDUSTRIAL Reclaimed Wood Display" is in sale since Monday, October 15, 2018. This item is in the category "Home, Furniture & DIY\Furniture\Bookcases, Shelving & Storage". The seller is "touchthewood-printtransfers" and is located in St Albans, Herts. This item can be shipped worldwide.